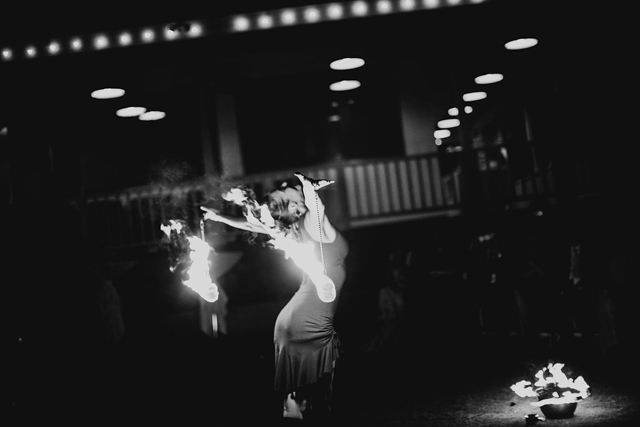 Poi fire dancing is the most commonly seen modality in fire dancing. Poi are constructed from chain, with Kevlar –blend wicks and a loop for finger grips. The art of poi dancing was what originally created the art form of fire dancing. There are a variety of ways to move and manipulate fire poi to create the mandalas of light that electrify viewers. Our modern day version of fire poi dancing utilizes specific moves and series of moves such a “Butterfly” patters or “Weave” patterns. There are endless ways in which fire poi dancing can create designs of light and motion, while many flow artists practice endlessly to master this art form. To reach a level of fluidity with fire poi dancing, first one must learn the basic movements of this dance, without fire of course. We encourage learning from a teacher for a one-on one experience and to assist you in faster learning curves. Many students begin with learning about ‘flow arts’ and begin with very basic understandings of timing, direction, speed, planes and dimensions of poi dance. This allows the learning curve to increase when lighting on fire for the first time. Fire poi dancing has gained tremendous popularity over the last decade, as many people find the art of this dance fascinating. It’s intricate patterns and movements challenge students and create new relationships with the mind/body connection. Our fire poi dancing technique and skill and proficiency has been gained over the years and is currently being displayed in our FIRE SHOWS and Choreography. Once beginning, intermediate and advanced levels movements are learned, one can then dive into learning choreography. Choreography is very niche oriented and takes years of diligent training and expertise to refine.